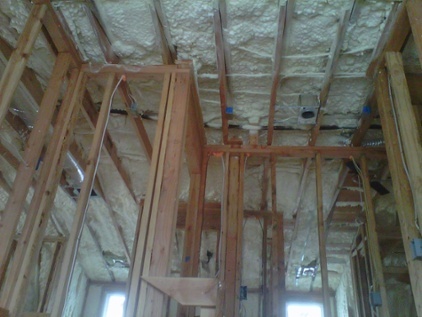 Installing spray foam insulation during the construction process is the ideal way to maximize energy efficiency. Building scientists stress the importance of "sealing tight & insulating right" whenever a new building is constructed. It's much more cost-effective to insulate effectively and correctly during new construction than to go back and retrofit later. That's why it makes sense to count on Coastal Insulation for all your new construction insulation and air sealing needs. Contact us today if you're located in East Windsor, Princeton, Montgomery or any other surrounding area and need insulation installation for new construction! There are many different types of insulation, and each type has specific advantages and limitations. Installing the wrong type of insulation can sometimes do more harm than good. For this reason, it's important to hire a contractor who can install the right type of insulation in different locations throughout your building. We match the insulation to application requirements, and we do a first-class job to ensure optimum long-term performance. We want to earn your business for all new construction insulation applications throughout East Brunswick, New Brunswick, North Brunswick, Monroe Township, Lawrence Township, Princeton, Marlboro and surrounding areas in New Jersey, New York, and Pennsylvania. Call or email Coastal Insulation to schedule an on-site consultation and free estimate with one of our building performance experts. We'll explain all your insulation options and help you select the best insulation package for your project.